Among other things you will get eyelashes for practice in the kit, we recommend that you practice the initial steps using these. 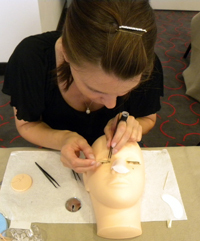 Along with this you can order either a Mannequin-Head or simply attach the trainings lashes with some micropore tape standing upright on a firm surface - as shown in this picture. The course is available in 5 languages: English, German, Spanish, Italian, French. the training and starter kit worth over 230 EUR. 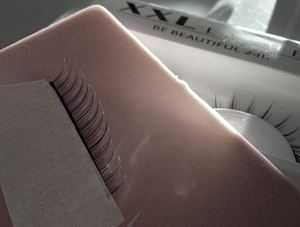 Upon successfully passing the test we will issue you a certificate qualifying you as an "XXL Lashes Stylist". With this step-by-step instruction training and the accompanying equipment you can acquire an additional qualification of merit in the shortest time possible which will have paid for itself after the first two applications.